Nail Fungus infections are quite common, affecting people of various ages, occupations and cultures. They are favored by excess sweat, inadequate hygiene and the wearing of worn out shoes. Unfortunately, they are also very difficult to get rid of, the treatment extending over a long period. While it is only normal to be frustrated, we bring you a piece of good news. There are antifungal solutions that you can resort to, to improve the appearance of the nails and escape from the infection altogether. What matters is that you take action as soon as you possibly can, opting for solutions that really work. When a nail fungal infection has occurred, discoloration will be one of the first symptoms to be on the lookout for. The affected nails might begin to thicken, becoming brittle with the passing of time. In case of more severe infections, you might notice that the nail has begun to separate from the bed; the skin around the nails becomes sore and an unpleasant odor can be felt at all times. The right topical treatments can help you get rid of the nail fungal infection, feeling better faster than you expected. These are applied directly on the nails and the surrounding skin, being available in the form of liquid solutions, nail polish, clarifying gels and foot soaks. You can also opt for portable laser devices, as these are highly efficient when it comes to treating fungal infections. You can use these three products to clean your feet and get rid of the debris caused by the fungal infection. They have a potent hydrating effect and softening properties, being easily incorporated into the daily shower routine and with an additional nail brush. The antifungal foot & body wash has some active ingredients, including aloe vera, Atlantic Sea kelp and essential oils (peppermint, rosemary, oregano, etc.). The ReNew toenail solution contains essential oils as well, including tea tree, rosemary, jojoba, oregano and eucalyptus. 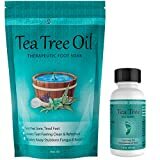 The tea tree oil foot soak contains a number of hydrating essential oils, including rosemary, camphor, lavender, eucalyptus, tea tree and peppermint. It also has Dead Sea salt and Epsom salt as ingredients. The foot and body wash is best used in the shower, with a small scrub brush (deep nail cleansing). Additionally, add the foot soak to warm water and soak your feet for a quarter of an hour. Use the ReNew toenail solution to keep the nails moisturized. Risk of skin irritation (discontinue usage in this case). The clarifying gel from NonyX is recommended to those who suffer from fungal infections, being highly efficient in eliminating the keratin debris and the actual infectious microorganisms. The product contains a number of active ingredients, including deionized water, ethanoic acid and Xanthan gum, as well as fragrance. The clarifying gel should be applied to the affected nails, both on the surface and below the tip of each nail. Several drops are enough for the product to work. The toenail fungus treatment from Omiera, Podiazole, promises to restore affected nails to their natural state. According to the manufacturers, it has potent antifungal properties; it improves the appearance of the nails, having a whitening effect at the same time. The antifungal treatment contains a number of active ingredients, including deionized water, agaratina extract, snakeroot leaf extract encecalin, uva ursi extract, propolis extract and aloe barbadensis juice. It also contains ingredients with hydrating properties, such as glycerin and glycolic acid. Other ingredients include menthol, salicylic acid and nourishing essential oils (tea tree oil, lemon grass oil, vitamin E oil). As a first step, it is recommended to file the affected nails. Apply the antifungal treatment and wait until it becomes dry. For the best results, it is recommended to apply it twice per day. Keep in mind that the treatment might extend over a long period of time, even several months. The antifungal nail solution from Zane Hellas promises to remove fungal microorganisms from both toenails and fingernails. It contains clinically-proven ingredients, being easy to apply and providing noticeable results within the first month of use. The product has a formula with natural ingredients, including extra virgin olive oil, oregano oil and almond oil. It also contains other organic oils, such as tea tree, calendula and avocado. Using the special brush, apply the antifungal solutions on the affected nails, as well as around them. For the best results, it is recommended to apply it once a day. Wait until the solution is 100% absorbed and your feet are dry. Cannot be used by pregnant or nursing women. If you are looking for an innovative solution to your fungal problem, the rechargeable laser device from Ncure might be just what you needed. Easy to use, it allows you to treat any kind of fungal infection in the comfort of your own home. Place the laser device on the affected nail and turn it on, by pressing on the button. The product works automatically, the light indicator providing information about it being in use. When the treatment session has finished, the light will turn off and you can remove the device from the respective nail. Charging is necessary before use. If you are suffering from a fungal infection, you can give all of the above-mentioned products a try. All of them have proven benefits, being produced by reputed manufacturers. They can help you get rid of the fungal microorganisms, improving the general appearance of the affected nails and reducing the risk of future occurrences. As you have seen, they contain active ingredients, many of which have potent antifungal properties. These solutions often have ingredients with hydrating and nourishing effects, so that they stimulate the nail to grow back healthy and strong. Just remember that the majority of the antifungal solutions take a long time to work; you need to be patient and wait until the nail is completely healed.